This news comes after popular food blogger Food Babe launched a petition this week asking the sandwich chain to stop using the chemical ingredient. 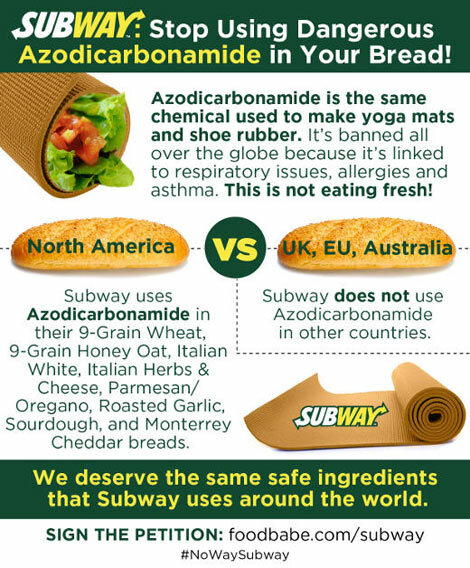 Subway said it will stop using azodiacarbonamide, a chemical used in the production of foamed plastics like yoga mats and rubber-soled shoes, in its bread. This news comes after popular food blogger Food Babe launched a petition this week begging the sandwich chain to stop using the chemical ingredient. “This is not eating fresh!” Food Babe’s petition said. Vani Hari has petitioned for other food companies to stop using chemicals, including Kraft and Chick-fil-A. The World Health Organization has linked it to respiratory issues, allergies and asthma. When a truck carrying azodicarbonamide overturned on a Chicago highway in 2001, it prompted city officials to issue the highest hazardous materials alert and evacuate people within a half mile radius! Many of the people on the scene complained of burning eyes and skin irritation as a result. The U.K. Health And Safety Executive has recognized azodicarbonamide as a potential cause of asthma. When azodicarbonamide is heated, there are studies that show it is linked to tumor development and cancer. Not only is this ingredient banned in Europe and Australia, but you also get fined 450,000 dollars if you get caught using it in Singapore and can serve 15 years in prison. The chemical azodicarbonamide can also be found in Wonder Bread.